The International Space Apps Challenge took place April 20-21, 2013. 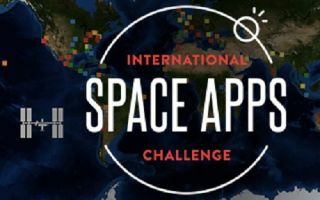 An interplanetary weather app, a spot-the-space-station tool, and a Mars greenhouse concept are among the winners of the 2013 International Space Apps Challenge. The contest solicited mobile apps and technologies that aid space exploration and enrich life here on Earth. Today (May 22), a panel of judges from NASA, the European Space Agency (ESA), and partners announced the winners of the contest, which collected 770 entries between April 20-21. More than 9,000 people from 83 cities around the world contributed to the apps submitted, according to NASA. Many of the contestants in the challenge, which is in its second year, used free cloud storage and services provided to all participants in the challenge by the company CloudSigma. "It's amazing to see the innovation coming out of this event, and we feel honored to have been a part of it,"CloudSigma CEO and co-founder Robert Jenkins said in a statement. The teams behind the six winning apps receive invitations to the November launch of NASA's robotic Maven (Mars Atmosphere and Volatile EvolutioN) Mars probe from Cape Canaveral, Fla., and a Spaceflight Training course at the National Aerospace Training and Research (NASTAR) Center in Pennsylvania. This Kansas-produced app integrates weather data collected by the Curiosity rover on Mars with live weather conditions on Earth to give users a forecast for both planets at once. A combination hardware-software entry, ISS Base Station, made in Philadelphia, includes an app that tracks the position of the International Space Station (ISS) over Earth, with a physical device that can point to the current location of the space station and alert users when it's in view. This concept, submitted by a team from Athens, Greece, proposes a reusable Martian greenhouse that would use aeroponics to grow spinach on the Red Planet. The idea includes resources, sensors and technology to stabilize the greenhouse environment over the 45 days it would require to harvest spinach. This project, invented in Gothenburg, Sweden, proposes a system for integrating climate data from NASA satellites with crowd-sourced data collected from people on the ground via garden sensors and other inputs to improve the overall picture of the environment. This London-based submission is a prototype app designed for astronauts living on the International Space Station who aim to photograph certain spots on Earth. The program would integrate weather data to alert spaceflyers when the orbiting laboratory was passing over those areas, if conditions permit photography at the time. This app, developed in Sofia, Bulgaria, won the votes of social media users around the world for its use in managing a backyard farm and tools to learn how to raise chickens.